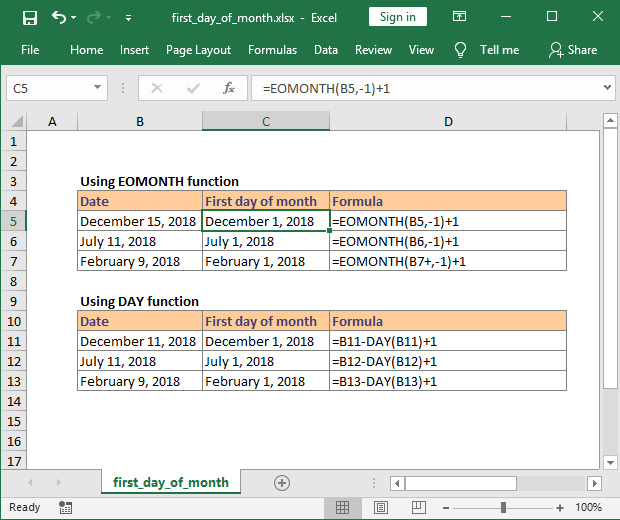 To get the first day of the month in Excel for a given date, you can use two simple approaches: using EOMONTH function or using DAY function. EOMONTH function returns the last day of a month, N months in the future or the past. In our case, we will need to retrieve the last day of the previous month. start_date – the date that represents the start date, in our case cell B5. months – the number of months before or after start_date. Since we need to get the end of the prior month we will use -1. Using this formula, Excel will return the last day of the previous month (in our case November 30, 2018) and then add one extra day. Note: Excel sees dates as numbers. Adding 1 will move the date one day into the future. Another way to get the first day of the month is by using DAY function, which returns the day of a date, represented by a serial number. The day is given as an integer ranging from 1 to 31. Since our original date is December 11, 2018 using the DAY function we will subtract 11 days from the date and then add 1. The result will be December 1, 2018.